Thelus N.W. and Thelus N.E. 1/5000. The Canadian Corp will take the VIMY RIDGE in conjunction with operations on other portions of the front. The 19th Canadian Battalion is attacking on our Left and the 3rd Canadian Infantry Brigade in on our Right. A portion of the 6th Canadian Infantry Brigade is to attach through the 4th Canadian Infantry Brigade when the latter’s objectives have been captured. To capture and consolidate portions of the German Support Line, the BLACK OBJECTIVE and the RED OBJECTIVE. The task of the 18th Canadian Infantry Battalion will be to capture and consolidate that part of the BLACK OBJECTIVE lying between A.11.s.70.35. and A.11.a.45.75. Northern: The NEUVILLE-ST-VASST – LES TILLEUS road. The road will be inclusive to the Battalion. Southern: From A.10.a.61/2.0. on British front line to A.10.b.3 ½ .1. on German front line, to A.11.a.0.1 ½ . to A.11.a.7.3. on LILLE ROAD. The Brigade will attack with the 18th and 19th Battalions in the front line, the 21st Battalion in Reserve and the 20th Battalion broken up for mopping-up and carrying parties. The leading Waves of the 18th and 19th Battalions will go straight through to the BLACK OBJECTIVE, which they are time to reach at 0.32[ii] minutes, leaving the mopping-up parties to deal with the intermediate trenches. The 5th Canadian Infantry Brigade on the left of the 4th Canadian Infantry Brigade will attack on a similar plan. The 6th Canadian Infantry Brigade will follow the 4th and 5th Brigades and, re-forming in the RED OBJECTIVE, commences the advance at 0.24x to the BLUE OBJECTIVE. It will also have the BROWN OBJECTIVE – the enemy guns in BOIS DE LA VILLE – GOULOT WOOD – And BOIS DU GOULOT – as its objective. The 18th Battalion will assault on a 3 Platoon frontage, and in 4 waves, with two intermediate lines of moppers-up from the 20th Canadian Infantry Battalion. First Wave will consist of 1 Platoon from each of “B” “C” and “A” Companies. Moppers-up will consist of 2 lines, each of 6 Sections of the 20th Battalion. Second Wave will consist of the respective 2nd Platoons of “B” “C” and “A” Companies. Third WAVE will consist of the respective 3rd Platoons of “B” “C” and “A” Companies. The “C” Coy. Platoon in this wave will form the Battalion carrying part and the other 2 Platoons will form the Battalion consolidating party. 4th WAVE (Battalion Reserve) will consist of the 3 Platoons of “D” Company. Sufficient distance to preserve formation, to be maintained between Waves. See Plate “A”[iv] which indicates distances to be maintained. These however are subject to change as they must conform with the distances maintained between Waves of Flank Battalions. The 4th Platoon of each Company will remain at the Transport lines. Jumping-off trenches will consist of present Observation lines on Battalion frontage and will be prepared for the purpose. All attacking troops to be in position two hours before 0. Battalion and Brigade Headquarters and Report Centres will, prior to 0., be located at ZIVY CAVE. During the advance the 18th Canadian Infantry Battalion will establish Report Centre near the German dugout at A.10.b.91/2.41/2. Artillery arrangements have been completed by the 2nd Canadian Divisional Artillery. Barrage Map[v] may now be seen at Battalion H.Q. Brigade Machine Guns have been grouped under Corps control for Barrage work. In addition to those the G.O.C., 4th Canadian Infantry Brigade will have Mobile Reservice of eight Machine guns of the 4th Machine Gun Company. Stokes Guns of the 4th Canadian Trench Mortar Battery will barrage German trenches till 0.6 at which time 4 Guns will come under the command of Officer Commanding 18th Canadian Battalion. At 0. the Artillery, Stokes and Machine Gun Barrages will open and the Infantry will advance over the open to the assault. At 0.3 the Barrage will lift from, and the leading Wave will capture, the German front line. The first line moppers-up will remain in, and deal with this trench. The First and Second Waves will continue to follow the barrage. At 0.8 the Barrage will lift from, and the Leading Wave will capture, the German Support Line. The 2nd line of moppers-up will remain in, and deal with this trench. The 1st and 2nd Waves will continue to follow the Barrage, which will advance according to the Barrage Table. At 0.32 the Barrage will lift from, and the Leading Wave will capture the BLACK OBJECTIVE. The 2nd and 3rd Waves will continue to the BLACK OBJECTIVE. The 4th Wave ill enter, or halt short of the BLACK OBJECTIVE, as circumstances may require. After mopping-up the German front line the 1st Line of moppers-up will join the 2nd Line of moppers-up in the German Support Line and consolidate this line. After capturing the BLACK OBJECTIVE, the 18th Canadian Battalion will consolidate this line. On attainment of Objective it is imperative for the purpose of exploiting the initial success that no time shall be lost by Company Commanders to affect re-organization. Completion of re-organization will be reported to Battalion Headquarters. The Brigade will establish a main Dump just off VISTULA at A.9.b.3.4. Eight Advance Dump in ZIVY TUNNEL. Brigade Expense Dump will be established at A.8.c.7.3 ½. (Junction of GUILLEMONT and ARRAS – LA TAGETTE Road) where stores required to complete personal equipment of assaulting troops will be issued as we move into the Line. Regimental Aid Post for the 18th Battalion will be located in ZIVY REDOUBT at junction of TERRITORIAL and MILL STREET. Walking Cases will be treated at 20th Battalion Regimental Aid Post at junction of BESSAN and TERRITORIAL trenches. Advanced Dressing Station will be located AUX REITZ at Junction of TERRITORIAL and DENIS LA ROCQUE. Main Dressing Station at MONT-ST-ELOY. Collection Post for Walking Cases will be established at AUX RIETZ – MONT-ST-ELOY and LA TARGETTE – MONT-ST-ELOY roads. Exact points will be notified later. Walking wounded: Vide S.S. 135 Section XXVII. TRAFFIC CONTROL & BATTLE STRAGGLER POSTS. The 18th Battalion will mount necessary Traffic Control and Battle straggler posts in their respective Jumping-off as soon as the areas are occupied. Personnel will be found from Platoons at Transport Lines. Vide S.S. 135 App. “A” pers. 9(i) and (ii). Vide S.S. 135 Section 26. Prisoners to be brought to Brigade H.Q. The Units holding the Battle front before 0. Day will gradually prepare the Jumping-off trenches as per sketch. They will also cut lanes in our own wire (4 per Platoon front) but the wire will not be removed from the gaps until the night before 0. As per S.S. 135 Section para. 1 and 2 (ii) Units will arrange badges as per S.S.135 Section 32 para. 2. Commanding Officer. O.C. “A” Coy. 2nd in Command. O.C. “B” Coy. [i] The 18th Battalion War Diary states that the battalion has a strength of approximately 600 soldiers. Without casualties, the battalion would be covering 1.6 yards of frontage per soldier. 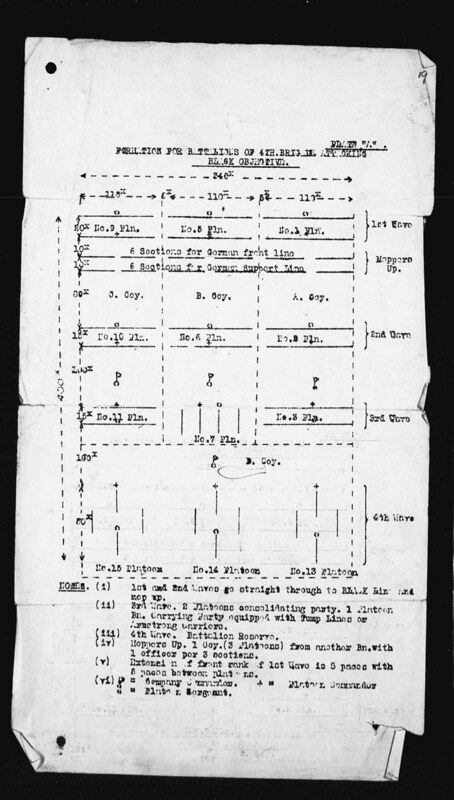 As can be noted by the battle plan, the Battalion would be holding this line in-depth behind the 6th Cdn. Inf. Bde. [ii] This method of allotting or designating time is new to the author. At times it appears to denote times after Zero Hour in tenths of an hour (6 minutes per increment) and at other times, such as this example, it designates time in minutes (0.32 represent 32 minutes after Zero Hour. It may be that any time with a single integer (i.e. 0.6) indicates tenths of an hour and any time with two integers (i.e. .32) indicates 32 minutes after Zero Hour. [iii] May indicate 75 minutes. See previous paragraph. [iv] See graphic titled “Plate A: Formation of Battalions of the 4th Brigade Attacking Black Objective” image posted in this blog article for the image representing the battle formation of the Battalion. 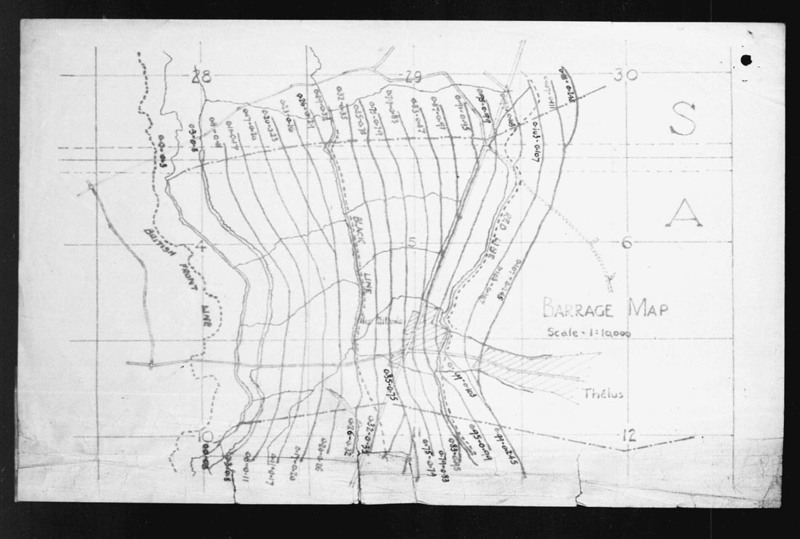 [v] Please reference the image titled “Barrage Map”.